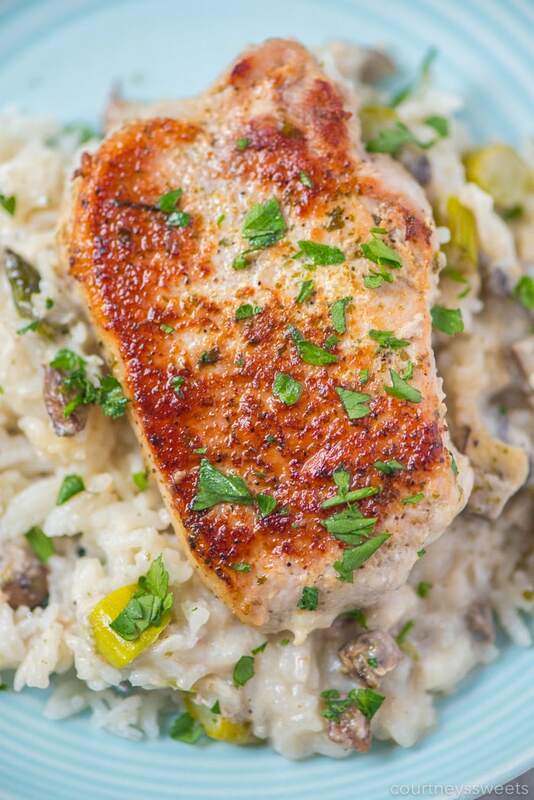 Full of flavor, Baked Pork Chops with Rice Asparagus and Mushrooms. This comfort food favorite is a one pan meal baked in a casserole dish. This is a sponsored post written by me on behalf of Smithfield Prime Fresh Pork. My family has always loved creamy chicken and rice. It’s a baked dish with chicken, rice, cream of mushroom soup, and maybe a few seasonings if you like. Then it dawned on me, what if I made pork chops instead of chicken?? 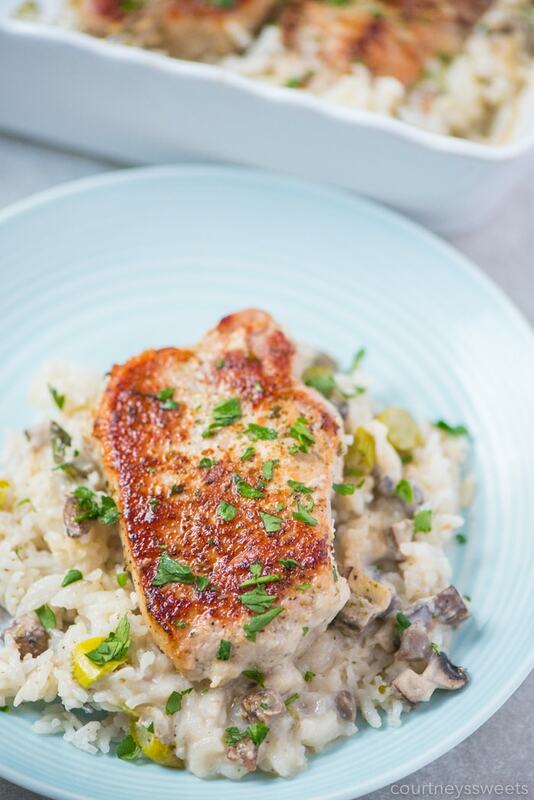 Now we’re sharing a flavorful twist on this classic by making the dish with pork chops, but also adding in fresh veggies like asparagus and mushrooms. 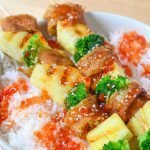 The tender rice mixed with the veggies pairs perfectly with fresh pork. I love to pick up the Smithfield Prime Boneless Fresh Pork Loin right at my local ShopRite. I can slice the pork chops into the thickness I need for any given recipe, plus you always save when buying in bulk. 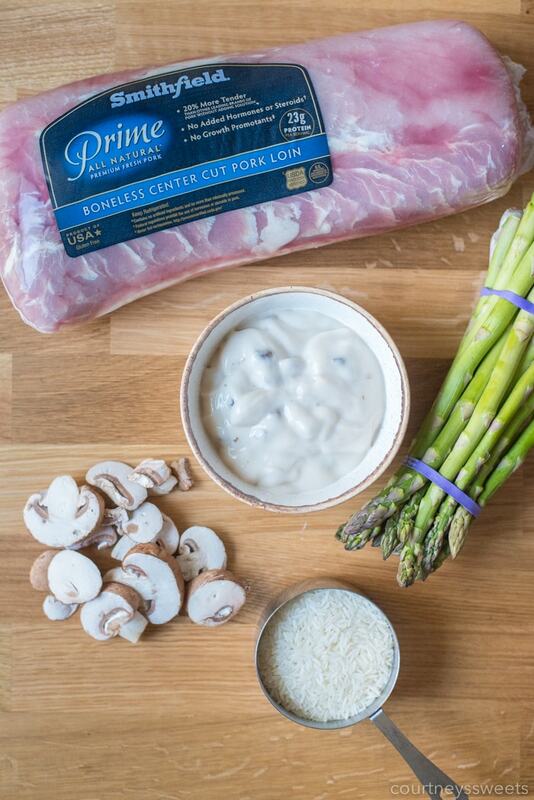 Smithfield Prime Fresh Pork is high-quality, all-natural, and has no artificial ingredients. They offer a large variety of hand-trimmed fresh pork cuts, including tenderloins, back ribs, spareribs, boneless and bone-in chops, butts and roasts, all of which have enhanced color and marbling. Find more recipe ideas and product information here. 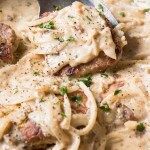 What do you need for this Baked Pork Chop Casserole? Preheat the oven to 350 degrees F and then get started on making the rice mixture. We use regular rice, not par cooked. 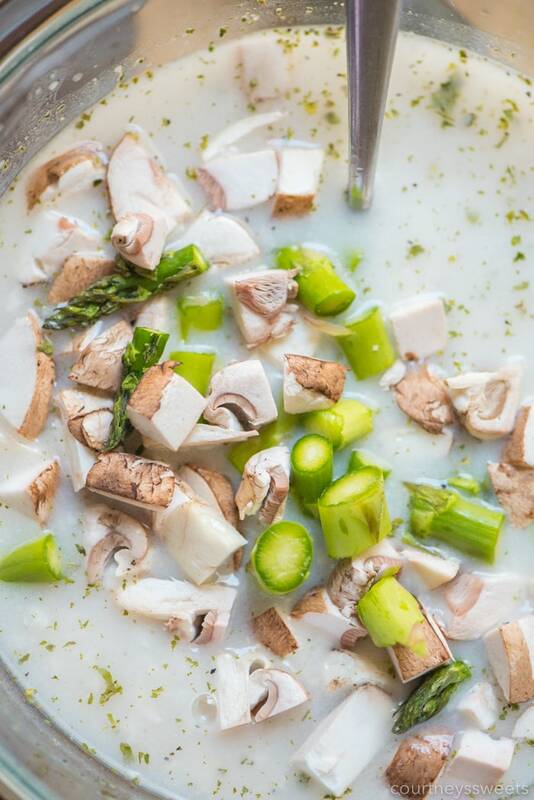 In a medium sized bowl, mix together the rice, cream of mushroom soup, water, asparagus, mushrooms, and seasoning, and then pour all into a casserole dish. Season the Smithfield Prime Boneless Fresh Pork Loin with salt and pepper and then also some parsley, garlic, and onion. Cut the pork loin into chops, place on top of the rice mixture, and then cover the dish with aluminum foil. For browning the pork, sear the pork chops in a large skillet over medium-high heat with a little oil before or after baking. 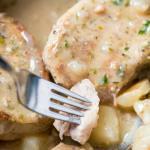 Otherwise, the pork chops will not have a nice golden brown color on the top. 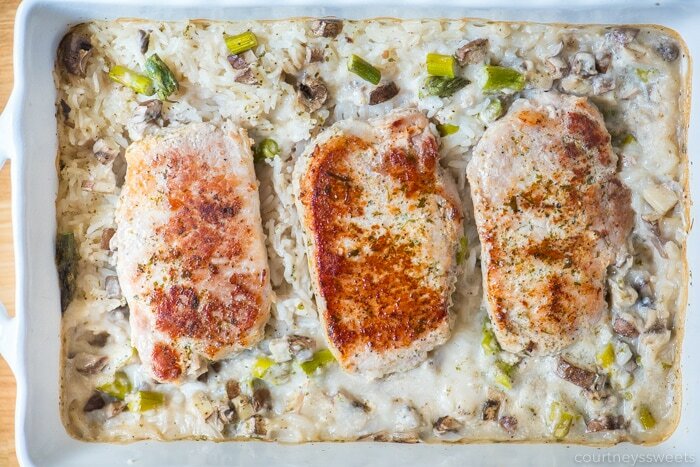 How long does it take to bake pork chops and rice casserole? 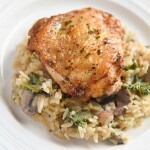 It takes about 40-45 minutes for the rice and pork chops to fully cook. 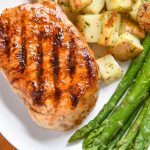 We recommend cooking pork chops until they reach an internal temperature of at least 145 F, but prefer 155-160 degrees F for medium well. 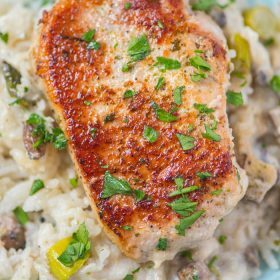 We also don’t recommend using thinly sliced pork chops for this recipe, as they will dry out before the rest of the ingredients can cook. You want tender pork chops and tender rice. We like cutting our pork chops about 1 1/2 inches thick. This ensures we have a juicy pork chop. 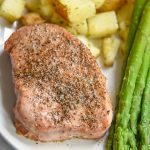 Since this recipe calls for baking in the oven, you won’t get that sear or brown crust on your pork chops. When I take it out of the oven, I have a really hot skillet ready with a tiny bit of oil and then sear the chops quickly just to brown. 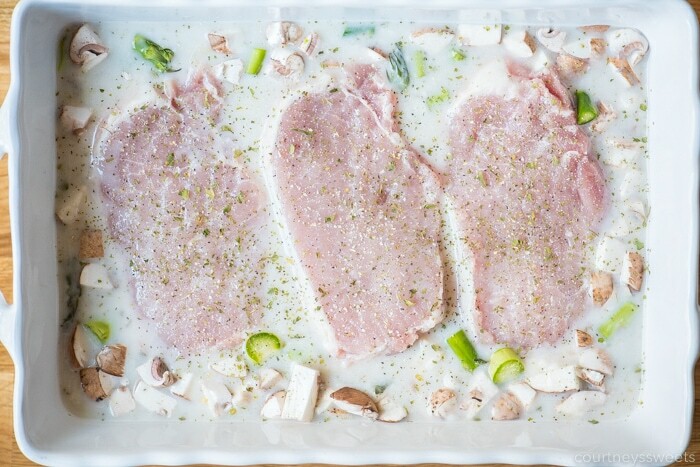 You could also do this right before baking as well, but we find it may dry the pork chops out as you may cook them too long, and we just want to make them a little golden brown. 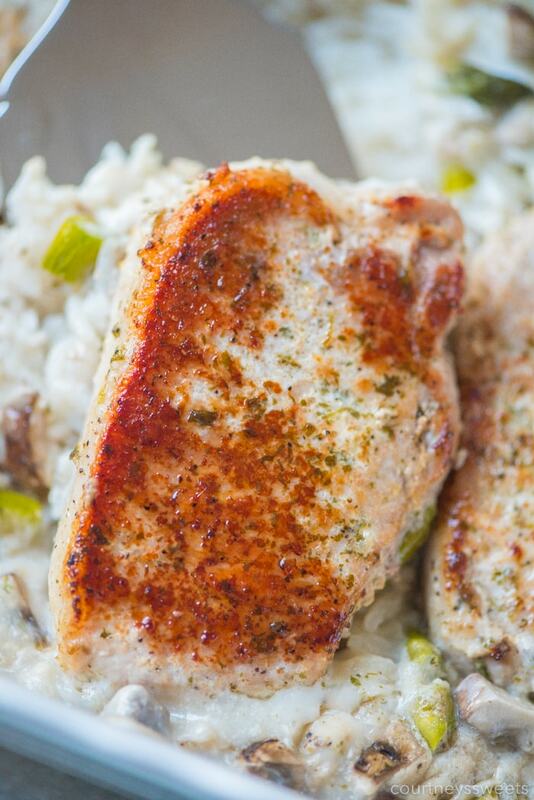 We do not add any salt to the rice mixture, but you can season the pork chops with salt if you want. Don’t like mushrooms? 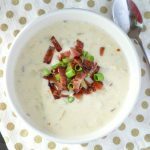 Use cream of celery soup instead or swap for other fresh veggies. If you don’t have white rice, you can use brown rice or even a rice mixture of the two to get in more fiber. If you’re using a large pork loin you can save the rest for another meal or recipe, or even make two trays. We love making a double batch for entertaining. Garnish with a little freshly chopped parsley to bring even more color to the dish. 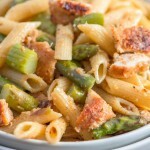 Casseroles can be too boring and blah, but not this dish! 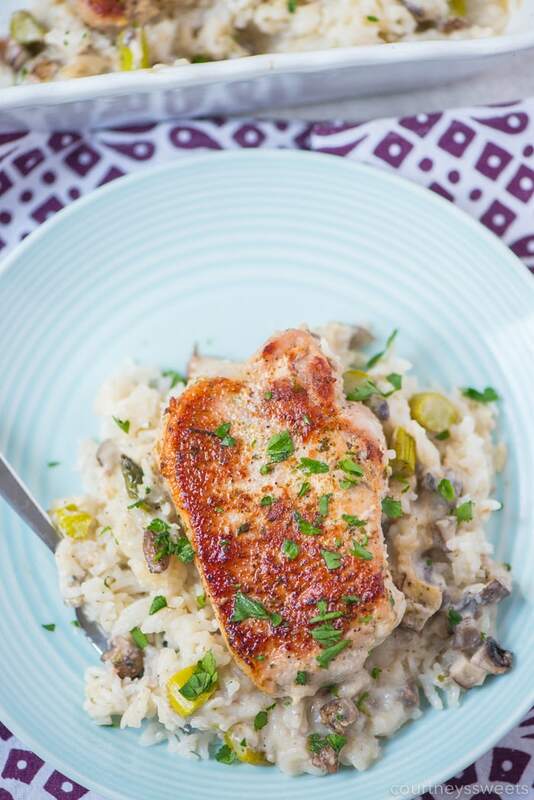 Full of flavor, baked pork chops and rice with asparagus and mushrooms. This comfort food favorite is a one pan meal baked in a casserole dish. Season the pork chops with salt and pepper and then also some parsley, garlic, and onion. Place the pork chops on top of the rice mixture and then cover the dish with aluminum foil. Bake for 40-45 minutes or until the pork and rice is fully cooked. To brown the pork, you can either sear before or after cooking a large skillet with a little oil. Don't like mushrooms? Use cream of celery soup. Want more fiber? Use brown rice. Garnish with a little freshly chopped parsley to bring even more color to the dish. Loved the the look and sound of this recipe. Unfortunately it didn’t cook especially not the rice in the given time. At 55min so far… Back in the oven it goes. Just need to get time right but smells good. Another thing is your oven may not be properly heating. I love testing my oven every few months with an oven thermometer to make sure it’s heating at the proper temperatures.